I'm not sure why I've been so concerned lately, but the fact that there is a volcano erupting and a swine flu outbreak isn't really helping my overall satisfaction with my plans for the apocalypse. Yes, I know I'm crazy, but admitting that I'm a nutball isn't really going to help me in a giant earthquake or alien attack, is it? Senorita Snarkalicious thinks I have a problem, but I don't think that anyone will see a problem with me opening up my 5 first aid kits when the giant spiders come to eat our brains. My friend Brandy, who I'm thinking of referring to as Mrs. Awesome because she is so awesome, brought me some awesome food storage so I'm going to be rocking the bean soup mix and chomping on some dehydrated carrots once the rabid monkeys are loose... that is until my family and I somehow travel to her house to share some 35 year old candy. I am still working out the kinks on a few other details (like WATER!) but I'm planning on getting together a group of a few ladies that want to be a bit more prepared and having a productive girls night. I've been slowly stockpiling flashlights and other little things so that I can at least read a magazine when the power goes out, and I've been talking to the kids about age appropriate emergency preparedness. I found some great information with a Sesame Street spin on it at Let's Get Ready! which is targeted at 3-5 year olds that gives info without being too scary. 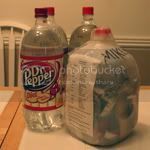 I also found some great instructions for 72 hour kits at Food Storage Made Easy that use empty milk jugs to hold contents to last 72 hours in an emergency. I hope to never use any of my supplies, but I'll sleep better knowing that when the ninjas turn on us I'll have bandaids and neosporin for a crowd! I don't think you have a problem. Emergency preparedness is ALWAYS a good idea, and more people should think about it. I do think that you should prepare for actually plausible emergencies, like volcanoes, earthquakes, flooding, fires and zombies. Being that I will be inside a secure windowless room with 2 cots, 12 other people and not much else, I am not worried. Better to be safe than sorry! Theres alot of things going on in the earth right now.. I don't think that's bad at all! Mrs awesome! seriously??? Your are so silly. I always ask myself WWGD. What would Gillian do? You are awesome!! !